1) This peer reviewed paper will be presented at the FIG Workign Week in Christchurch, New Zealand. The paper considers examples in New Zealand of non-linear deformation that includes post-seismic relaxation and slow slip events. New Zealand’s actively deforming landscape results in both gradual and imperceptible deformation to instantaneous block shifts. The geophysical processes that cause the deformation include the tectonic plate motion (slow, regular deformation), earthquake events (instantaneous coseismic deformation), post-seismic relaxation (slow regular deformation) and slow slip events (irregular deformation occurring at timescales from days to years). Network RTK (NetworkRTK) and GNSS processing engines are current day positioning applications that need to be able to accommodate deformation that may be slow or fast, regular or irregular, in order to maintain accurate and reliable coordinates. Most commercial software can only apply velocities that are assumed to be linear. Deformation effects that are non-linear are not accounted for, which potentially leads to inaccurate coordinates. There are two aspects that need to be considered. The first is the ability to model the reference station coordinates, e.g. NetworkRTK. Secondly, the ability to model and transform non-reference station coordinates to the local datum, e.g. the rover positions computed using NetworkRTK and the positions derived from a GNSS processing engine. For reference station coordinates, geodetic time series modeling can be used to accurately model both linear and non-linear deformation. But it becomes more challenging to model non-uniform deformation at non-reference positions. This paper considers examples in New Zealand of non-linear deformation that includes post-seismic relaxation and slow slip events. Most current day surveying applications, including survey and GIS software, utilize coordinate systems that are based on a datum that is referenced to a specific epoch in time. At a high level, modern datums may be able to accommodate global tectontic motion (e.g. semi-dynamic datums), but most applications and software assume that the coordinates are unchanging. This simple model works well in regions of the world that are located in the central, stable, regions of the major tectonic plates. The model fails in regions that are actively deforming, which are typically located on the tectonic plate boundaries. Some examples include California (USA), Indonesia, Mediterranean countries, Japan and New Zealand. Over the last two decades, GNSS has been used as a prolific tool to measure crustal deformation at local, regional and global scales. High precision static network solutions have typically been used for large and small scale land deformation and RTK applications used to measure centimetre level deformation. Where the measured velocities are linear, the deformation is uniform and is reasonably easy to correct. However, we are now observing irregular or non-linear deformation that has been caused by earthquake events (e.g. coseismic and post-seismic relaxation) and slow slip events (SSE). The deformation caused by coseismic offsets can be relatively easily measured and modelled through a combination of post-earthquake geodetic surveys, continuous GNSS (cGNSS) and differential interferometric synthetic aperture radar (DInSAR). Earthquake post-seismic deformation evolves over time and is most easily observed using networks of cGNSS sites, although DInSAR technology is also a useful tool. Similarly, SSE deformation requires measurement techniques that regularly measure position such as cGNSS and DInSAR. Deformation events affect the underlying geodetic infrastructure. Most modern coordinate systems in use today time tag the coordinates to a reference epoch that is before the current epoch. This necessitates the computation of current positions in terms of the reference epoch, which can be done using a coordinate transformation or by applying the secular velocity. Following an earthquake event, neither of these methods are possible since the actual site deformation needs to be accounted for. The effect of active deformation becomes even more complex when applications, such as Real Time Kinematic Networks (NetworkRTK) and GNSS processing engines, are being used. Both systems require reference station coordinates in the current epoch, which requires the prediction (or otherwise) of the current position. The coordinates of traditional geodetic infrastructure, for example network marks, need to be either updated or an appropriate deformation model needs to account for the events. Coseismic deformation is straight forward to implement (see e.g. Crook and Donnelly, 2013), once the offsets have been observed and modelled. More problematic is deformation that is non-linear or deformation that evolves over time. Post-seismic deformation tends to be regular in nature but requires frequent repeat measurements over an extended period of time that can require years in order to adequately model the effect. SSE tend to be irregular and can only be modeled adequately after an event has occurred. New Zealand’s location in the South West Pacific has resulted in the land mass straddling the Australian and Pacific tectonic plates. Crustal deformation resulting from instantaneous events (e.g. earthquakes), short term events (e.g. volcanoes, slow slip events) and long term secular plate motion all affect the geodetic infrastructure. Arguably the most stable region of the country is north of Auckland (Australian plate), although in the recent past Auckland has a history of volcanic activity that has a high probability of occurring again. South of Auckland the interaction of the plates becomes highly visible in the Taupo Volcanic Zone (TVZ), which exhibits high thermal activity and back-arc spreading (Darby and Meertens, 1995). Further east is the subduction zone associated with the Hikurangi Trough and caused by the Pacific Plate subducting under the Australian Plate. This subduction zone extends along the east coast of the North Island and finishes under the northern South Island. The subduction zone gives rise to the vocanic activity seen on the Central Plateau (central North Island). In the South Island, the dominat feature is the Alpine Fault that extends approximately 650km from Blenheim across the northern South Island and along the western edge of the Southern Alps to Milford Sound. The Marlborough Fault System, in the north of the South Island, has a number of subparaellel faults that transfers the plate boundary deformation from the Hikurangi Trough to the Alpine Fault. The subduction of the Pacific plate discountinues, the Alpine Fault starts and continues to Puysequr subduction zone to the south-west of the South Island (Pearson et al., 2000). The motion of the central segment of the Alpine Fault is strike slip with a component of compression that gives rise to the uplift of the Southern Alps. Further south under Fiordland, the Australian plate is subducted under the Pacific plate. The implication of New Zealand straddling the Australian-Pacific plate boundary is that the country is actively deforming. This results in changes in the relative position of the crust, which distorts the geodetic infrastructure and in turn results in a degradation of the accuracy of survey marks. Following the acceptance of the theory of plate tectonic in the 1960s, the effect of land deformation has been well known although little was done about it. Once GNSS had been demonstrated to be a viable and cost effective positioning tool, standard static GNSS baseline networks soon measured land deformation of up to five metres over the last century (Blick et al., 2009). This resulted in a new geodetic datum, the New Zealand Geodetic Datum 2000 (NZGD2000) (Grant et al., 1999). Users of position data (e.g. mapping agencies, GIS, utility companies, engineering, topographical and cadastral surveys), prefer non-changing coordinate data that is typically referred to a static geodetic datum. This is not practical in New Zealand due to the active deformation and depicted in Figure 1. To account for the national deformation, GNSS data (both campaign and cGNSS has been used to compute the national velocity field. The first model was based on campaign GNSS data observed between 1992 and 1998 (Beavan and Haines, 2001). 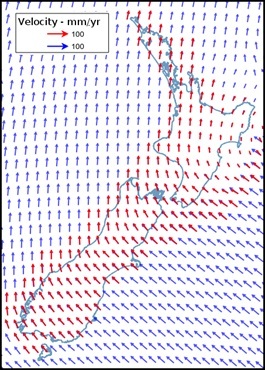 Except for the eastern side of the North Island, the magnitude of the velocity is reasonably constant at 40 mm/yr. Active plate boundaries result in frequent events such as earthquakes and slow slip events, which in turn results in non-linear velocities. A secular or constant velocity field only (Figure 1) is insufficient to define point positions accurately and this resulted in the development of a National Deformation Model (NDM) that enables the inclusion of localized deformation models to account for earthquake related activity (e.g. Jordan et al., 2007). Figure 1: Vietnam Decentralised Land Administration System Figure 1: The (secular) velocity field of the National Deformation Model (NDM). Original model (red arrows) based on GNSS campaign data from 1992-1998 and the current model (blue arrows) based on campaign GNSS and cGNSS up until 2011. Since 2003, there have been twelve major earthquake events with MW > 6. Many of these have results in ground surface movement, which if not accounted for, will result in a degradation of the geodetic network. Many of the events occur in Fiordland (south-west of the South Island) and as this region is largely rural (National Park), it does have a great impact. However, other events, such as the Darfield and Christchurch events (2010-2011) had a huge impact (Kaiser et al., 2012). Most of the Central Business District has been demolished and is in the process of being re-built. To support the rebuild including roading, underground and cadastral infrastructures, the survey and geodetic network (including levelling) has had to be re-established (sometimes several times). This required the development of a localized deformation model for the Canterbury (including Christchurch) region (Winefield et al. (2010), Crook and Donnelly (2013)). While earthquakes such as the Christchurch events (2010-11) are catastrophic, from a geodetic point of view they are reasonably straight forward to deal with. 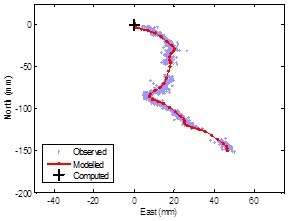 The earthquake occurs, the coseismic offset can be measured using a combination of techniques, for example GNSS positions, DInSAR; the regional deformation pattern modelled and, in the case of New Zealand, incorporated into a NDM (see e.g. Crook and Donnelly (2013)). Today, many countries are establishing and using NetworkRTK infrastructure that streams the carrier phase data from multiple reference stations for processing. Compared to single base RTK, one advantage of NetworkRTK is that the distance dependent errors are modelled on a regional basis (e.g. atmospheric, orbit), which in turn improves the accuracy and reliability of NetworkRTK over extended distances. Two issues that affect the performance of NetworkRTK is the accuracy of the reference station coordinates and ability to transform a user’s position to the local datum. Similar issues arise for GNSS processing engines. These engines are often developed for global applications and work well when the velocity field is well established or a standard global geological plate motion model can be used e.g. NUVEL1A (DeMets et al., 1990, DeMets et al., 1994), MORVEL (DeMets et al., 2010, Argus et al., 2011). Example processing engines are shown in Table 1. The engines are generally simple to use requiring an email address for the processing results, GPS/GNSS data files (RINEX, some accept propriety data formats and multiple data files), antenna type and height. Advantages of GNSS processing engines include automated processing and data only needs to be collected using a single receiver. where is the position (coordinate) (metres) at time t, is the reference position (metres) at time , is the site velocity (metres/year), is the time (years) and is the reference time (years). When a site is affected by deformation this simple model is inadequate and will, over time, result in inaccurate positions and the degradation of the performance of the NetworkRTK. Provided the site velocities are uniform over the region covered by the NetworkRTK, the coordinates may be transformed using standard transformations e.g. Helmert Similarity or Horizontal Conformal transformations. Depending upon the user’s application, these transformations could be simplified to a block shift (e.g. Haasdyk and Janssen, 2012). Standard transformation methods do not work satisfactorily when the regional velocity field is non-linear and specifically when non-uniform deformation needs to be taken into account. An extended model (e.g. Denys and Pearson, 2015, Pearson et al., 2015) must be determined that includes the non-linear deformation. This can be achieved at cGNSS sites that operate continuously and hence the position can be determined on a regular basis (e.g. daily positions) and the deformation modelled. The challenge is how to model the deformation at sites that are not cGNSS, for example the rover GNSS in a NetworkRTK or an arbitrary site for which the data is being processed by a processing engine. If the deformation is uniform, then an interpolation method would be adequate. Simple interpolation may not work if the deformation is not regular, either in time or space. Time series analysis can be used to model deformation at cGNSS sites. Denys and Pearson (2015) provides detailed modelling that includes coseismic events, post-seismic deformation and slow slip events. Examples are given for the Christchurch events in 2010-2011 (coseismic), Dusky Sound 2009 (post-seismic and transient velocity) and slow slip events (Gisborne, Kapiti Coast). Modeling of other common systematic biases such as seasonal effects (cyclic terms) and equipment changes (e.g. antenna offsets) has been ignored. Kaiser et al. (2012) reported the combined geological, geophysical, seismological, geodetic effects of the Christchurch earthquake. As shown in Figure 2, four major earthquake events were seen in the cGNSS sites in the region between epoch 2010.68 and 2011.98 that resulted in a total horizontal displacement of 150mm (Figure 2). Figure 2: Christchurch 2010-2011 earthquake events. Left: horizontal plot ; and right times series plots (East, North, Height)..
where is the offset (metres) (e.g. coseismic) for the event (years), and is the number of offset events. 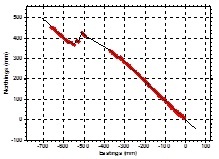 Figure 3: Horizontal plots for cGNSS sites PYGR (top) and MAVL (bottom). The maximum horizontal displacement for the Dusky Sound Mw 7.8 earthquake was approximately 1.7 metres. Bevan et al. 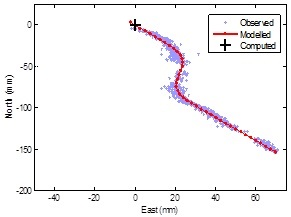 (2010) modelled the earthquake coseismic and early post-seismic slip distribution by inverting the GPS and DInSAR observations. This data could be the basis of a deformation model that accounts for the immediate effect of the earthquake, but it is now obvious that the post-seismic deformation is a significant long term factor. Although the post-seismic relaxation was very significant (Figure 3, sites PYGR, MAVL), the velocity of cGNSS sites are up to 3 mm/year different compared to the pre-earthquake velocity. (In Figure 3, note the direction of the linear velocity trends pre and post event). 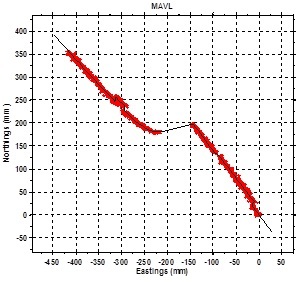 The Mavora Lake (MAVL) site also shows the George Sound event (2007) (-15mmE, +25mmN) and the effect of a faulty antenna (-300mmE, +250mmN) (Figure 3). 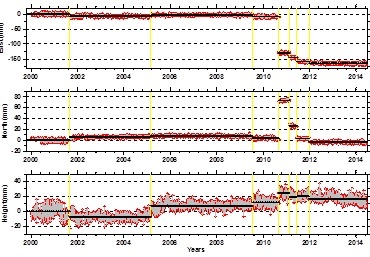 Figure 4: Site GISB showing slow slip events since 2003.
where is the velocity offset (metres), is the transient velocity (metres/year), is the start time and is the end time of the velocity event (where may be the end of the time series if the velocity change is ongoing as is the case for many stations affected by the Dusky Sound post-seismic relaxation) and is the number of events. The Hikarangi trench subduction zone extends south along the East Coast of the North Island to the top of the South Island. The nature of the slip along the subduction zones changes from more freely slipping in the north to less freely slipping (greater coupling) in the south (Douglas et al., 2005, Wallace et al., 2004). On the surface, this corresponds to more frequent events lasting a few days to a week in the north to less frequent events that last months to a year in the south. An example of a northern site that is affected by frequent SSE is Gisborne (GISB) (Figure 4). In contrast, further south, around Wellington and the Kapiti Coast (west of Wellington), the subduction is deeper and results in events that occur only every 5-7 years but last for a longer period of time. 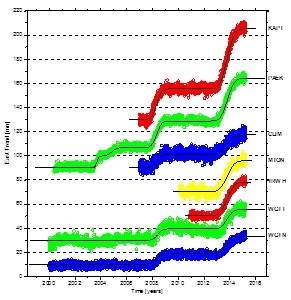 Figure 5 shows the time series evolution of seven sites that occupy a region of approximately 100 km × 50 km with events occurring in 2003, 2008 and 2013. There is a high level of coherence in the East component with all sites and all SSE moving to the east (western secular motion, Figure 1). The amplitude of the SSE varies between sites. Although the amplitude of the North component is smaller, there is greater variability in the direction of the SSE between sites. where is the amplitude of the SSE (metres), is the midpoint of the event, is the period of the event. When using NetworkRTK or GNSS processing engines, it is the deformation events that are time dependent that need further consideration. In particular, the post-seismic deformation following a major event (e.g Dusky Sound 2009) and the slow slip events (e.g. Kapiti Coast). The coseismic deformation is generally a one-off event and once modelled, can be readily accounted for. Once the immediate post-seismic decay stabilizes, it is clear that the site velocities are different to the secular velocity prior to the event. Although the difference in velocity is small (generally < 3 mm/yr), the difference becomes significant over time (e.g. after 10 years, the difference amounts to 30 mm). These changes in velocity need to be accounted for in Network RTK applications. In the case of the NDM, an alternative approach was taken where the immediate post-earthquake deformation is ignored (removed) and therefore modelled by a single offset term. An additional velocity term is included to account for the change in velocity. Figure 5: The detrended (velocity) East and North time series of sites showing up to three long period slow slip events in the Wellington and Kapiti Coast regions. Clearly, the velocities at sites affected by SSE may change significantly over periods of a few days to months at a time. In such cases NetworkRTK systems that internally determine site velocities may be grossly in error. This is especially true when the network does not include sufficient sites that are stable and have reliable (linear) velocities. Figure 6: Slow Slip Events on the Kapiti Coast. Figure 6 shows two sites that are affected by the Kapiti Coast 2013 event. The velocity prior to the event is approximately the long term secular velocity for each site. However during the event, which last approximately a year, the direction of the velocity is nearly 90° compared to the long term direction. Following the event, the direction returns to the long term average, but both sites moved to the north-east by approximately 50 mm. As described in Section 4.3, this event occurred on a regional scale. Models can be created on a site by site basis that allows accurate reference station coordinates to be extrapolated. Clearly, as this deformation is ongoing, the model need to be updated on a regular basis in order to maintain accurate coordinates. How often the model needs to be updated will depend upon the degree of deformation and the coordinate accuracy required. The reference station coordinates can be modelled, but the velocities at locations within active deformation zones may not be able to be interpolated directly. It cannot be assumed that the velocities of the reference sites are applicable. Examples include a kinematic/semi-kinematic rover position or GNSS data being processed by a GNSS processing engine. Apply the secular velocity field. This ignores any deformation but applies the long term regional velocity. Regional modelling of the spatial distribution of the deformation e.g. regional grid, Delany triangulation. Regional modelling using a geophysical model e.g. Okada, TDEFNODE (McCaffrey et al., 2013). New Zealand is an ideal natural laboratory to study the effects of non-linear geophysical processes that affect geodesy and surveying applications. While there are sophisticated tools to model cGNSS position time series and correct positions for non-linear processes, similar techniques are not yet available in commercial software. This can potentially introduce errors into the coordinates used by the NetworkRTK reference stations and thus introduce biases in the coordinates derived using these systems. In addition, New Zealand has developed a sophisticated National Deformation Model to correct for both linear velocity fields in plate boundary zones and earthquake displacements. We do not currently have similar tools to correct for non-linear processes such as post-seismic relaxation and slow slip events. Argus, D. F., Gordon, R. G., and DeMets, C., (2011). Geologically current motion of 56 plates relative to the no-net-rotation reference frame, Geochemistry, Geophysics, Geosystems, 12:Q1101, doi: 10.1029/2011GC003751. Beavan, J., and Haines, J., (2001). Contemporary horizontal velocity and strain-rate fields of the Pacific-Australian plate boundary zone through New Zealand. Journal of Geophysical Research, 106(B1): 741-770. Beavan, J., Samsonov, S., Denys, P., Sutherland, R., Palmer, N. and Denham M., (2010). Oblique slip on the Puysegur subduction interface in the 2009 July MW 7.8 Dusky Sound earthquake from GPS and InSAR observations: implications for the tectonics of southwestern New Zealand. Geophysical Journal International, 183: 1265-1286 doi: 10.1111/j.1365-246X.2010.04798.x. Blick, G., Donnelly, N., Jordan, A., (2009). The Practical Implications and Limitations of the Introduction of a Semi-Dynamic Datum – A New Zealand Case Study. Geodetic Reference Frames, IAG Symposium, International Association of Geodesy Symposia 134: 115-120. Crook, C. and N. Donnelly (2013). Updating the NZGD2000 deformation model. Joint Proceedings of the NZIS conference: Celebrating the Past, Redefining the Future and SIRC NZ 2013 Conference. Ed. Denys, P., Strack, M., Moore, A. B. and Whigham, P., Dunedin, New Zealand, New Zealand Institute of Surveyors: pp40-46. Denys, P. and Pearson, C., (2015). Modelling Time Dependent Transient Deformation in New Zealand. In Proceedings of International Symposium on GNSS (IS-GNSS 2015), 16-19 November 2015, Kyoto, Japan. Haasdyk, J. And Janssen, V., (2012). Site transformations: A block shift in thinking. In Proceedings of 17th Association of Public Authority Surveyors Conference (APAS2012), 19-21 March 2012, Wollongong, Australia. Jordan, A., P. Denys and G. Blick (2007). Implementing localised deformation models into a semi-dynamic datum. Dynamic Planet - Monitoring and Understanding a Dynamic Planet with Geodetic and Oceanographic Tools. P. Tregoning and C. Rizos. Cairns, Australia, 22-26 August 2005. IAG Symposium 130: 631-637. Kaiser, A., Holden, C.., Beavan, J., Beetham, D., Benites, R., Celentano, A., Collet, D., Cousins, J., Cubrinovski, M., Dellow, G., Denys, P. Fielding, E., Fry, B., Gerstenberger, M., Langridge, R., Massey, C., Motagh, M., Pondard, N., McVerry, G., Ristau, J., Stirling, M., Thomas, J., Uma, S. R. and Zhao, J., (2012). The Mw 6.2 Christchurch earthquake of February 2011: preliminary report. New Zealand Journal of Geology and Geophysics 55: pp67-90, doi 10.1080/00288306.2011.641182. McCaffrey, R., King, R. W., Payne S. J., and Lancaster, M., (2013). Active Tectonics of Northwestern U.S. inferred from GPS-derived Surface Velocities. 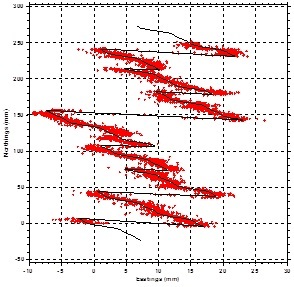 Journal of Geophysical Research: Solid Earth 118(2): 709-723, doi:10.1029/2012JB009473. Pearson, C., Denys, P., and Hodgkinson, K., (2000). Geodetic constraints on the kinematics of the Alpine Fault in the southern South Island of New Zealand, using results from the Hawea–Haast GPS transect. Geophysical Research Letters. 27: 1319-1323. Pearson, C., Crook C., and Denys, P., (2015). The development of a station coordinate prediction program to model time series from Continuous GPS stations in New Zealand. IAG Symposia 146, doi: 10.1007/1345_2015_177, in press. Ross, L. A., Denys, P. H., Williams, C. A., Pearson, C. F., Faegh-Lashgary, P., Beavan, R. J., Hamling, I.J. and Townend, J., (2013). Post-seismic deformation associated with recent New Zealand earthquakes. Proceedings of the American Geophysical Union (AGU) 46th Annual Fall Meeting. Retrieved from http://fallmeeting.agu.org/2013/. (2013) Poster. Wallace, L. M., Beavan, J., McCaffrey R. and Darby, D., (2004). Subduction zone coupling and tectonic block rotations in the North Island, New Zealand. Journal of Geophysical Research: Solid Earth 109, B12406, doi: 10.1029/2004JB003241. Winefield, R., Crook, C. and Beavan, J., (2010). The application of a localised deformation model after an earthquake. FIG Congress 2010 - Facing the Challenges – Building the Capacity. Sydney, Australia. Paul Denys: I have been an academic staff member at the School of Surveying, Otago University since 1995. I teach papers in Survey Methods and Survey Mathematics. My primary interest is GNSS positioning and geodetic data analysis with a focus on active deformation. New Zealand offers an excellent opportunity to study and understand the broad scale deformation of the Australian-Pacific plate boundary as well as focusing on specific problems: Central Otago and Cascade deformation, Southern Alps uplift and sea level rise. I have also been involved with the geodetic analysis of the Christchurch earthquake sequence and its application to the maintenance of the geodetic infrastructure. Chris Pearson: Since 2011 Chris has been a lecturer/research fellow at School of Surveying, Otago University where he has been active in measuring earth deformation and has collaborated with LINZ to develop tools such as PositioNZ-PP and made contributions to the NZGD2000 datum. Prior to this he worked for the US National geodetic Survey where he was project lead for maintaining the US National Deformation Model. Chris is currently acting as an advisor to the Government of Nepal on modernizing their national datum.